Everton produced a perfect demonstration of what is to come under new manager Roberto Martinez, as the Blues passed the ball beautifully to leave League Two Accrington Stanley bewildered and for the first 20 minutes of each half, chasing Blue shadows. Much tougher tests will come and go when the season begins, but this pre-season work out was perfect for the Blues, as the players continue to understand and comprehend the ethos and style Roberto Martinez is so keen for his players to adopt. Darron Gibson is quickly becoming the fulcrum of the team, acting as the pivot point, with all the play flowing through him in the centre of the team. Gibson’s ability to accurately play the ball both short and long will be crucial in ensuring the Blues are able to stretch teams during the season. Key to Martinez’ approach is to keep the ball moving at all times, quick one and two touch passing in the midfield pulls the opposition team out of position, allowing space on the flanks to be exposed. With Everton’s fullbacks eager to get forward down each wing, Oviedo, Baines and Coleman were expertly picked out by Gibson and Fellaini and on each occasion the fullbacks had space to attack the opposition and deliver dangerous balls into the box. Fellaini appeared to grow in stature as the game developed, and the defensively minded position he will be expected to take up, is similar to the role he plays for Belgium. If Everton are able to fend off the envious glances of other Premier League teams, then Fellaini will perfectly complement the efficiency offered by Gibson. Fellaini’s energy, his ability to quickly close the opposition down and his drive to burst forward will make Fellaini and Gibson an ideal midfield pairing. Martinez is aware that the remodelling of the Everton team continues to be a work in progress and he will at times require the Evertonians to remain patient. The ex-Wigan manager, will be eager to inject further pace to his forward line and with Jelavic and Kone not yet considered ready for first team action, he does have plenty left in reserve. Kevin Mirallas offered a teasing glimpse of his special talents and with Spanish teenage sensation Gerard Deulofeu due on Merseyside next week, Everton will be a different proposition in attack in the coming weeks. Everton did however score four goals on Wednesday night, each of them well taken. Darron Gibson opened the scoring with approximately 10 minutes on the clock, passing the ball into the corner of the net after a Kevin Mirallas corner was delivered perfectly into his path. Everton were quickly two goals to the good. 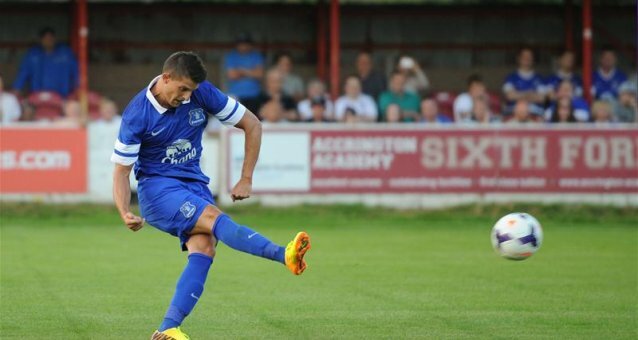 The second goal again arrived from a Mirallas corner. The initial ball in was cleared at the near post, but when the ball arrived back at the feet of Mirallas the Belgium delivered an accurate cross onto the head of Anichebe, who had the simple task of directing the ball into the gaping goal. Everton were three up before half time and this time Mirallas was the goalscorer. With Baines not yet on the pitch, the Belgium took the opportunity to take set-piece duties and his curling free kick left the Accrington keeper wrong footed and Everton were cruising. Everton did concede prior to half time, a lack of concentration and some poor defending let in Nicky Hunt on the right, and with Oviedo working hard to rectify his mistake the ball was centred for Peter Murphy to prod home. Martinez will be disappointed with the goal, especially because no one picked up the run of Murphy on the back post and neither of the two centre backs was able to intercept the ball as it rolled along the edge of the six yard box. Everton re-established their three goal advantage in the second half with a perfect example of the Martinez approach. Pienaar and Gibson linked up well in midfield, before the latter picked out Coleman in space on the right hand side. The Irishman provided a perfect cross for the on rushing Osman to head home and complete a pleasing night for the traveling Blues. Team: Joel; Hibbert (Coleman), Ovideo (Baines), Jagielka, Distin (Alcaraz); Gibson (Junior), Fellaini, Osman; Mirallas (Pienaar, Grant), Naismith (Gueye), Anichebe (Vellios). Previous Post Time for Rooney to come home?